If a doctor misdiagnoses a patient’s malady and prescribes an inappropriate medicine, we would not expect recovery to good health. Should the doctor persist in the faulty diagnosis and prescribe further doses of the wrong medicine, the wise patient seeks a second opinion. As evidenced by the experience of Greece last year, it is the misfortune of the residents of the eurozone that second opinions are not allowed. In the early years of this decade the European Commission, fronting for governments powerful members, diagnosed eurozone members as suffering from lack of competitiveness in international trade. The medicine implied by this diagnosis, controversial from the outset, included fiscal “consolidation” and “structural reforms”. The first of these, summarized in the word “austerity”, dictated expenditure reduction and tax increases to reduce fiscal deficits. The diagnosis implied emphasis on the former, because social expenditures allegedly harm competitiveness, as would higher taxes. The most important “structural reforms”, vague enough to cover all policies to make policies more pro-business, involved reduction in worker and trade union rights, especially collective bargaining. Governments of the putatively “uncompetitive” countries were lectured that obedience to the Commission’s prescriptions would eliminate efficiency-undermining maladies by “down-sizing” the public sector and directly reducing the production costs constraining wage growth. In a more enlightened era this diagnosis and prescription would have been described as “mercantilist”, selecting government policies with the explicit goal of a trade surplus. The chart below shows that the Commission-fronted fiscal policies were associated with a decline in public sector deficits. 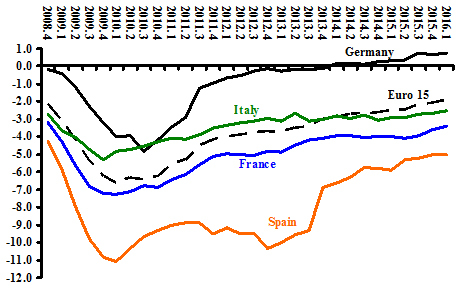 Fiscal deficits bottomed out in late 2009 (France, Italy and Spain) and late 2010 (Germany). 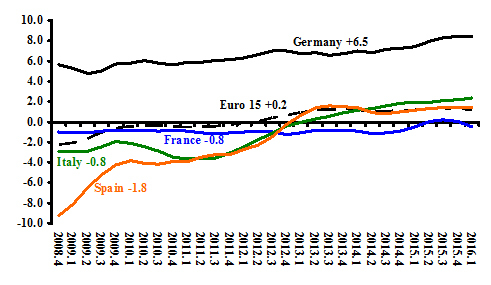 On average the Euro 15 (the foregoing four plus others adopting the euro in 2000-2001) reached its lowest point in early 2010 and subsequently rose. Was this a success of austerity policies? 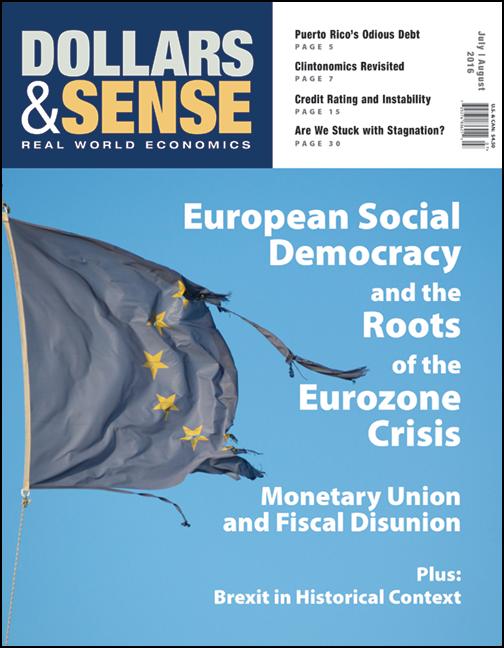 Dating the beginning of austerity policies involves considerable subjectivity. As a programme implemented across the eurozone 2011 seems an appropriate date. On the basis of when governments adopted European Commission approved austerity packages the BBC suggests late 2011 or early 2012. If we accept this dating, the onset of deficit reduction preceded austerity policies by at least a year except for Spain. Scepticism about the effectiveness of the EC prescription for deficit reduction increases by comparing the terminal years in the chart. Though the German fiscal balance rose into surplus, after eight years France and Spain remained slightly below their 2008 values. The Italian government achieved a very marginal deficit reduction (-2.7 to -2.5), and the contraction of the deficit for the Euro 15 disappears if we exclude Germany. Notes: Euro 15 is an EU category includes those eurozone members from 2001. Current account statistics provide more favourable results for the EC diagnosis and prescription (see chart below). The German current account balance increased to over 8% of GDP in 2016, which according to the FT “boosted” the government’s popularity. In Spain a deficit of almost -9% of GDP changed to a small surplus (net reversal of ten percentage points), with a less dramatic but strong shift in Italy from about -3% to +2%. The French current account increased slightly (briefly positive), and all Euro 15 countries showed increases except Belgium and Luxemburg. When assessing success in generating current account surpluses one must keep in mind that a decline in a country’s trade deficit implies a fall in domestic expenditure. The most common form this takes is a decline in household consumption. The striking case among the larger countries is Spain. In 2008 Spanish per capita income was €24,400 and in 2016 will be slightly lower at 23,740. Had it remained the same share of GDP, household consumption would have fallen by about 2.5% over the eight years. Because of the large shift in the trade balance, private consumption per capita in 2016 was almost ten percent lower than in 2008. In Ireland, one of the Euro 15, the trade surplus shifted by a massive 30 percentage points, leaving household consumption in 2016 almost 25% below its 2008 level. These numbers demonstrate what until recently was a consensus across the economics profession – generating trade surpluses reduces the welfare of a population and in extreme cases impoverishes households. This is especially the case when a surplus derive from depressing wages and output. In itself a trade deficit need not bee a problem because short or long term money inflows can finance it. Many countries, including EU members, have sustained trade deficits for extended periods, Britain being most obvious case. A trade deficit does not necessarily indicate “lack of competitiveness” however defined. In general it is not a problem that requires policy action even within a currency union. Note: numbers in legend average for entire period. A recent article in the Financial Times cites the dubious Markit indices to tell the reader that the eurozone recovery has “weathered the shock” of the British vote to leave the European Union. I stress “dubious” because the PMI for Germany showed an increase while the Munich-based Ifo index reported a drop in “business confidence”. Considerably more informative than these methodologically problematical attempts to capture subjective sentiments is that the FT considered annual growth rates less than 2% to qualify as “recovery”. This is a textbook case of redefining failure as success. Productivity growth plus growth of the labour force represents the lower limit to the potential growth rate when a country’s economy operates near full capacity. When below full capacity, the case for all eurozone countries with the possible exception of Germany, growth rates can rise considerably above this. Across the eurozone countries private sector labour productivity growth slowed after the financial crisis of 2008-2010, but was well above one percent annually. This number implies that taken together the eurozone countries must growth at least by 1.5% to prevent a rise in unemployment. As the chart below shows, since 2012 only the Spanish economy sustained an annual rate of growth substantially above 1.5%. Over the four quarters through June 2016 the German and French economies grew at rates just sufficient to prevent unemployment increasing, while the Italian rate fell far short. 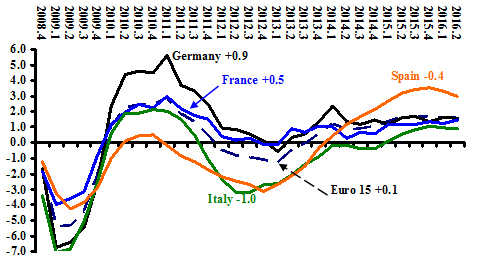 On average across the eurozone GDP expansion was insufficient to lower the unemployment rate. No rational person would call this “slow recovery”. It is stagnation. Fiscal deficits have fallen across the eurozone and most countries have passed from current account deficits to surpluses. So slow has been progress on the former that the hypothesis cannot be rejected that initially larger deficits due to fiscal stimulus would have brought deficits down faster. Similarly, the current account surpluses in most countries may reflect depressed domestic demand rather than greater competitiveness. The German Chancellor described the British referendum result a “deep break in European history”. At the meeting in Bratislava in mid-September she will face a range of complains and challenges, many of which have their source in the region’s economic stagnation. One can speculate about the political health of the EU had she and her finance minister spent the last six years stimulating the European economies rather than “consolidating” and “reforming”.